The first two weekends in May, Evanston becomes the home of the Bach Week Festival. It's not all Bach, but lots of his works. And those other composers are also well-known Baroque masters: Vivaldi, Handel, Quantz, and Heinichen. Each concert is special, with the grand finale presenting the B Minor Mass. Four regular performances on Fridays at 8 PM and Sundays at 7 PM, plus two ‘Candlelight' specials at 10:15 PM after the Friday concerts. Running the whole shebang is Richard Webster, organist and choirmaster at St. Luke's Church, where all the performances are held. That is, when he's not out running himself. "I do my best musical thinking," he says, "when I'm pounding the path along the lakefront. It's time you can't do anything else. You can't practice. It's a great time to meditate and a great time to be creative musically." And those feet have carried him over lots of ground, including the Boston Marathon. But back to Bach. Webster is certainly a fan. "In my opinion there's never been a greater, more prolific or more imaginative composer in history than Bach, and his music will keep us busy for many years to come." This, by the way, is the 28th Festival. "We began in 1974, and by 1982 we'd done virtually all of his orchestral music, a good deal of his chamber music and many of the cantatas. So, that year we decided to branch out and do other composers of the baroque era. We've also done music of Mendelssohn because of his connection with the Bach revival in the mid-19th century, and even Stravinsky's "Dumbarton Oaks" Concerto along with the Brandenburg Concerto #3, upon which it's based." Webster says that he feels it's important to offer listeners not only the good-old standbys, but also the lesser-known works of Bach, as well as music of a few others such as Zelenka and Heinichen who are not household names. "We've unearthed some terrific pieces," he says, "so we offer the Brandenburgs, which will fill the house, and then also present something that they've never heard before, and they come away delighted." He finds audiences like what they like, and some are more open-minded than others. "We get interesting fan-mail, some of it highly supportive of our venturing out, and others wanting to hear just the music of Bach. We like to keep stretching the limits of this festival." Besides those already mentioned, the Bach Week has also given music of other family members - Carl Philip Emmanuel Bach, and Wilhelm Friedemann Bach, two Johann Sebastian's more famous offspring. I suggested including music by the Chicago-area composer Jan Bach, just to keep it a "Bach Festival" and Webster said he'd certainly consider it. "It's my job to make Bach look good, which is the nature of the festival." But the inspiration is not just from the composers. The genesis of each year's programming comes from the musicians themselves. Webster talks of the process. "Often we hear things on the radio that we like to include. If we're in the car, we pull over to the side and write down the information. And after the festival is over, we throw a big party for all the musicians where I ask what they want to do next year. That's when they come forward with wonderful suggestions - concertos they've always wanted to do and never had the chance." And it's important to realize that there will be a ‘next year.' "We feel very confident about our future," Webster continues. "Our management has been very prudent in keeping expenses modest. One can never say Bach Week is an extravagant affair. The quality of the performances is what commend this festival." Who are the musicians? They're from the Chicago area, of course. Webster told me that some interested players from New York, the West Coast and even Europe have inquired about performing. "We tell them politely that part of our mission statement is to highlight local musicians, and certainly there are so many in town that we don't have to go any further. We do have alumni who have moved away and we will bring them back, but they already have a connection to the festival. Once a Bach Week Musician, always a Bach Week musician!" Among them, the flutist Louise Dixon has played in every festival and was given a special gift during the 25th anniversary season. So much for the performers. What about the public? "We keep ticket prices very reasonable," Webster assured me. The audience comes from all over Chicagoland, and even from Wisconsin and Indiana. "We have a couple who fly in from Grand Rapids Michigan every year," Webster says proudly. Besides his regular job at St. Luke's, where he keeps his choirs totaling about 60 voices well-maintained and involved, Webster teaches part time at Northwestern University in the department of organ and church music. And, like all working musicians, he free-lances around when the time is available and the interest motivates him. On top of all that, he's also a noted composer of sacred music, and finds it very satisfying to put pen to paper the old-fashioned way. 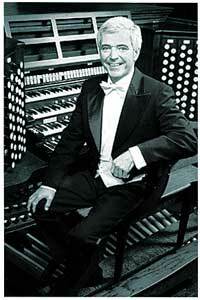 But he's also up-to-date, with a new CD recorded on the recently restored E.M. Skinner pipe organ. The Bach Week Festival in Evanston. It's a short time, just two weekends, and it's intense for everyone, but the musicians rehearse efficiently. Webster feels it's a gift to the citizens of Evanston and the entire Chicago area. After all these years, they're going strong, so they must be doing something right. Bruce Duffie grew up in Evanston, and was with WNIB, Classical 97 in Chicago for 25 years. His E-mail address is duffie@voyager.net.